Before recapping our stream, a brief story about my experience with Astroneer prior to our Monday night stream. When Astroneer first hit Steam Early Access back in 2016, I sunk some time into it; 18 hours of time, to be exact. My goal? Dig a hole straight through a small planet so that I could hop into it on one side of the planet, and the planet's gravity would result in shooting me out the other side before it then pulled me back down through the same hole and I'd go back out the original side. It was a dumb goal, but it seemed entirely do-able. My first few initial attempts involved just pointing my terrain tool at the ground under my feet and sucking away the dirt. I hoped I'd make it before I a) ran out of oxygen, b) ran out of power, c) was killed because the slightest bump when you're close to a planet's core, where gravitational forces are high, is like hitting a brick wall at 60 mph, or d) all of the above. The result of most those attempts was "all of the above." I then started what can only be described as a massive mining operation that involved a slow and steady downwards spiraling ramp, dropping tethers along the way so I could maintain oxygen/power, and hiking my way back up to the surface every so often to resupply at a nearby base I'd setup just to support this effort. It was a lot to do, and I was getting closer and closer, but then my kiddo came along and all mining operations were put on hold. I never got a chance to go back in and finish - I'm also pretty sure there was a major update that wiped my progress - but I've never regretted that time spent. You may have read all that and thought "what? Why would you do that?! Wasn't there something better to do?!" and all I can say is "because it was fun and relaxing." I could have spent time building a shuttle to go to another planet and setup a new base of operations there, but trying to achieve that arbitrary goal that I set for myself just seemed like the best thing to do at the time. To me, that's kind of Astroneer in a nutshell: hop in and ask yourself, "what do I want to do today?" I said this back in 2016 and it's still true: compared to other titles in this same vein/genre, such as No Man's Sky or Starbound, Astroneer feels like the whole point is just to relax and have some fun for a while. The whole thing feels like it is setup to truly embody the idea of a "sandbox"; a space where you're free to create, build, and destroy without any real repercussions or consequences for when things go wrong (and sometimes those make for the best moments). That core of the game is still present in the version you can play today, and there have been a number of improvements and changes along the way. Building your base is easier and a little more intuitive (medium base components go on medium platforms, large go on large). 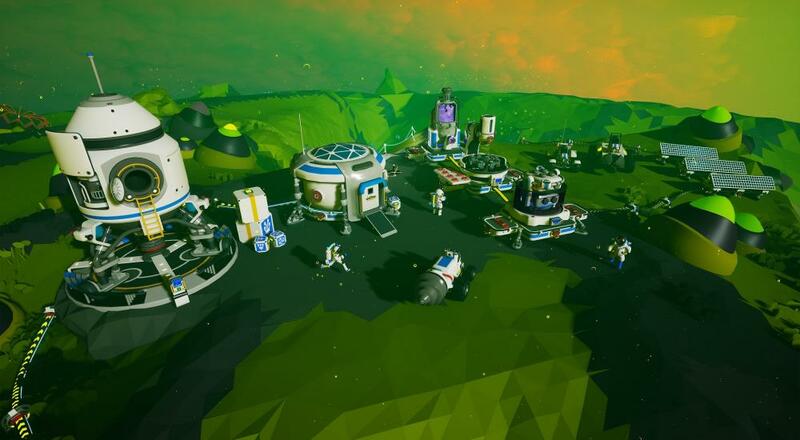 It only took me about an hour to setup the little colony we showed off in our stream, and if I had to do it again, it'd undoubtedly take me less time than that now that I know what I'm doing. 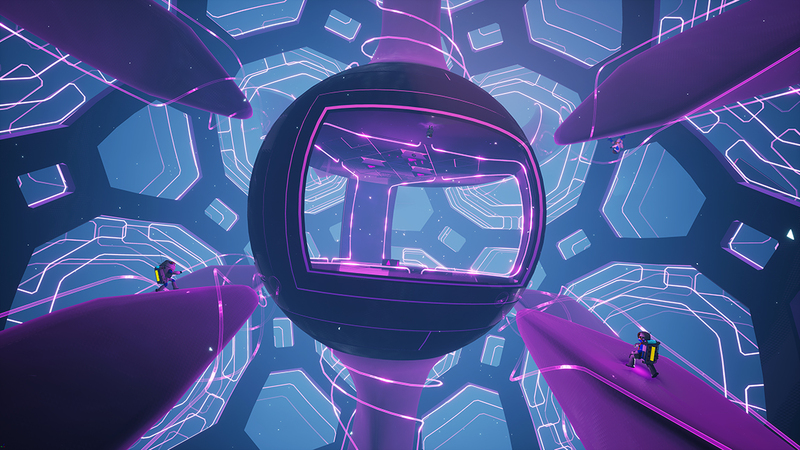 Beyond that, there's now a whole research tree that lets you unlock new structures to create. Unlocking those items requires you to scan local flora and other curiosities, or bringing some larger curiosities back to your base and placing them in the Research Station, which generates "Bytes" of research over a period of time. Once you've unlocked a new structure, you can see what materials you'll need to make it on the 3D printer, and even get info about where those materials are located. All of this helps to create a better sense of direction/progression if you're ever wondering what to do next. Want to make that Medium Recycler so you can do something with all this debris lying around? You'll need Iron, which is on a different planet so your next goal is to make a shuttle so you can get there from here; a quick series of short objectives to achieve that gives you something to do for the next 45 minutes to an hour but can easily be picked up and resumed later. Outside of quality-of-life changes, System Era also added mysterious structures that are scattered about the planets for players to explore when they need a break from setting up their colony, mining minerals, blasting off to other planets, or digging holes to nowhere. These are described as "high level adventure goals"; something to hunt down and do if you want some kind of "endgame" objective. While I may go searching for these things one day, for now, I'm just enjoying getting my base in order and tidying up after my friends stopped by. As with any kind of sandbox game, bringing buddies into the mix can yield interesting results. Some friends may be eager to help you build up your base (all progress is tied to the host) and establish a new trade empire, while others may want to open a hole under your feet and keep going until you fall into a cavern. Maybe you and your buddies will find new, creative ways to engage with the physics in the game and setup a (deep) underground basketball court where the gravity goes a bit wonky. Perhaps you'll create a rover speedway in the sky so you can see who will win the Desolo Grand Prix. The tools are always there for you and your friends to make your own fun. Out of the numerous sandbox/open-world games I've played over the years, Astroneer is the first one that's ever really got its hooks into me, and I believe it's due entirely to their terrain deformation tool. I don't have to sit and watch an animation of my in-game avatar chipping away at a rock to clear it out, or keep clicking a mouse button achieve the same. I point, click, and a whole section of the ground is just gone. Click-and-hold and I'm hoovering my way through a planet, sucking up any and all resources that may be in my path. If I need to cross a particularly large gap, I can just instantly make a land bridge between two points; I don't need to first chop down trees, then make planks from the wood, then find rope, and THEN build a bridge. Again, just point, click, and I've got a bridge. That one gameplay mechanic turns so much of what is tedious/monotonous in other games into a whole new way to play in the sandbox.